Watch time crawl with this exclusive Demon Clock desktop widget for Windows! 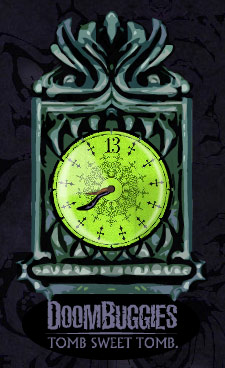 This working clock features a "13" at the top and an eerie monster face just like the grandfather clock it's modeled after in Disneyland's Haunted Mansion. You can drag it around the desktop, and it features a quick link to DoomBuggies.com for any time you need a foolish mortal fix of Haunted Mansion media.